Great new for IS-mini / IS-miniX users! You can use WonderLookPro without paying nothing! You need to just connect IS-mini / IS-miniX to your PC. WonderLookPro's license will be upgraded to Gold, Silver, Bronze license. You can activate one PC, and the activated PC do not require IS-mini connection. There are two kind for paid license, PC License and USB dongle license. Paid license will be enabled the control of third party LUTBOX, control of cameras and support for the large scale projects. PC License is the one which is usable only for the activated PC. If the PC has Internet connection, you can easily move the license to other PC. USB dongle license is used by inserting the dongle into PC only when the licensed functions are needed. You have to use WonderLookPro keeping the dongle inserted. You can use the dongle for multiple PCs. Following is the explanation of each licenses. For IS-mini/IS-miniX users, you can use almost all of the functions of WonderLookPro without purchasing the license. 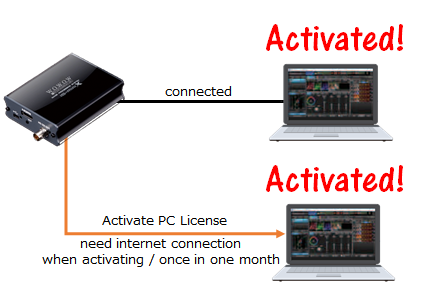 This IS License is valid when you connected IS-mini/IS-miniX when you are using WonderLookPro, but you can activate one PC which can use IS License without connecting IS-mini/IS-miniX devices(IS-PC License). This activation can be done only for one PC from one real device. Once you activated the PC, you can use IS License on this PC without connecting IS-minis. You need to connect to Internet once in every month to confirm the license validity. If you are going to use third party LUTBOX or to control cameras, you have to purchase paid license. The prices are hugely reduced, especially for after one year subscription rate. You can select 5 years package or automatic payment subscription. There is a couple of methods to purchase the license, part of them is to purchase through dealers and others are through purchasing online. If you are going to purchase the license online, you can input dealer code to get discount. Basically the license period is finite but you can register to subscription for automatic payment and automatic activation. When you are going to purchase from a dealer, following steps are required. It may takes a while because of the dealers procedures. 1. Register as Free License. 3. Wait for the contact by the dealer, and confirm the period of the license and make order for it. 4. After the dealers procedure, you can activate the license automatically just restart the WonderLookPro. You can extend the period the license by the similar steps. You have to purchase the license with USB dongle option from dealers. Please contact your dealer near by. If you don't know the contact, you can make the request by following steps. 3. Wait for the contact by the dealer, and confirm the USB dongle option and the period of the license, and make order for it. 4. USB dongle will be delivered from the dealer. If you don't need USB dongle option, and you are in a hurry, you can purchase the license online and start using it immediately. And you can get discount if you contacted to the dealer beforehand to input the dealer code. 3. After finishing the payment on Paypal, you can restart WonderLookPro and found it activated by the purchased license. There is a method to purchase the license for the PC which can not connect to the Internet. 1. Create PC Information file on WonderLookPro's license management. 2. Send the PC Information file to your dealer to ask for the activation of the license. 3. Deaer will send the license file and 6 digits activation code for you to be input to WonderLookPro, which activate the license offline. Corporate License includes 5 PC License and there are no restriction of the functionality. One USB dongle is included in the basic package. You have to ask dealers to purchase Corporate License. 1. Decide the number of the PC license, period and the number of USB dongle to make request to the dealer. Please inform user administrator's mail address as well. 2. The dealer delivers login ID, password and ordered USB dongle. 3. Inform login ID and password to the user in your company to make the request for the activation in WonderLookPro. 4. The administrator will receive the email of the activation request, and clicking the ULR in the mail make admission of the user's license activation. 5. The user just restart WonderLookPro to activate the license. You can make activation by these steps for the rest of the PC licenses. one USB dongle is included.